The EFCC has arrested the Director General of the Pension Transitional Arrangement Directorate (PTAD) Nelly Mayshak who was recently suspended over an alleged N2.5 billion fraud. The anti-graft agency also arrested three of her staff who it alleged served as front for her in the award of fictitious contracts, sources told Daily Trust yesterday. The staff are Yoab Youssoufou, Patricia Iyogun and Ruth Imonikhe. Mayshak was suspended indefinitely in March over allegations of fraud uncovered in the PTAD. The directorate is an independent pension agency established in August 2013 to oversee management of pensions under the Defined Benefit Scheme for pensioners who are not part of a new contributory scheme. EFCC sources told Daily Trust that investigations into the alleged fraud revealed that Mayshak misappropriated about N2 billion of the N2.5 billion. She inherited the money from the pension’s account of the Head of the Civil Service (HOSF) mainly meant for Nigerian Immigrations Service (NIS) Nigeria Customs Service (NCS), and Nigeria Prisons Service (NPS). She is also said to have embezzled about N500 million meant as take-off grant for PTAD. The source said the alleged fraud was committed in the award of contracts during her three-year tenure. “In one instance, Mayshak allegedly approved N25, 410,000 contracts for the supply of 121,000,000 litres of fuel in one day when in fact there was no corresponding storage capacity. PTAD only has storage capacity of about 11,000 litres, which lasts for about a month,” the source said. 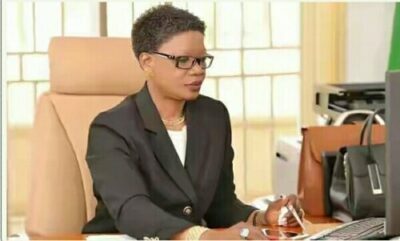 Mayshak is also alleged to have awarded several phony contracts to cronies and staff of PTAD, through which she enriched herself because they only served as fronts for her. The source added: “Between December 8 and 30, 2014 she awarded multiple contracts to the same company, Interactive Wide Nigeria Limited, to the tune of about N29, 377,993.26. The source said investigations revealed that “Yousoufou, Team Leader, ICT owned Belzacode; Imonihke, Team Leader, DG’s Office, owned Hosley Nigeria Limited while Iyogun, Team Leader, Customs, Immigration and Prisons Pensions Department, said to be a sister-in-law to Mayshak, owned Pabak Nigeria Limited. Minister of Finance Kemi Adeosun suspended Mayshak when the scandal broke to enable unhindered investigations. The minister’s office said that the allegations against Mayshak did not relate to pensioner’s fund but to operational expenses of PTAD. “The suspension which is a normal civil service procedure is to pave way for an unimpeded investigation into the activities of the directorate under the watch of Mayshak. Mayshak it was gathered first ran into trouble during the tenure of the former Accountant General of the Federation, Jonah Otunla. She was alleged to have demanded the sum of N3 billion earmarked for the verification of pensioners nationwide to be released to her, but Otunla refused. Otunla, reportedly argued that the verification exercise was supposed to be carried out by the Office of the Accountant General of the Federation and not PTAD.